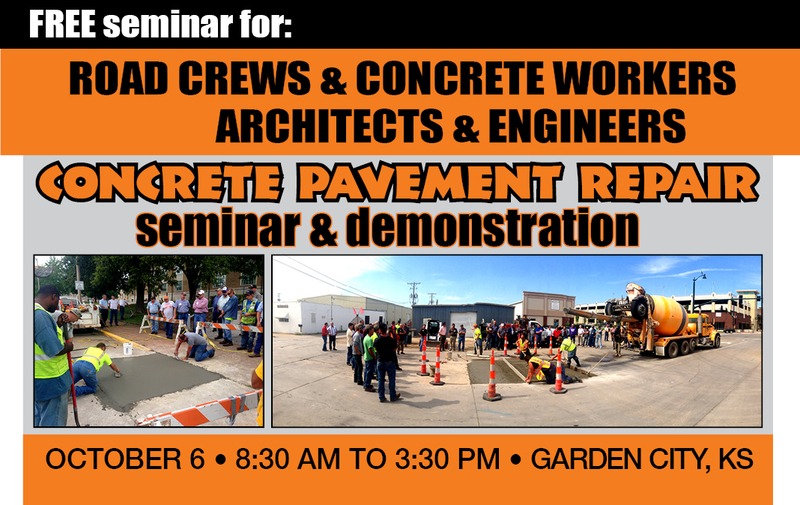 The Kansas Ready Mixed Concrete Association (KRMCA) is hosting one of it’s most popular seminars, Concrete Pavement Repair (CPR). This seminar will provide persons responsible for street maintenance and repair, the knowledge necessary to maintain quality concrete streets. Durability, ordering concrete, curb & pothole repair, mix design, use & application of admixtures, and advancements in roller compacted concrete and full depth reclamation will be some of the topics discussed at the seminar. We will also have a live demonstration showing the proper use and poor of concrete. •Anyone responsible for the design, construction and repair for street maintenance. THIS EVENT IS FREE: Includes lunch, breaks, and any course materials. Please register by October 2, 2015. In the event you are unable to attend, you may send a substitute. Fax: (785) 235-2544 or email: aschuster@kapa-krmca.org. Questions, call (785) 235-1188.